Bottles are 4 fluid oz. Everything you need to create brilliant tie-dye art! It’s as easy as this: Empty one pre-measured packet of soda ash into each applicator bottle of powdered dye. Fill the bottles with warm water, shake, and start dying! These kits include 6 of the brightest, most vibrant tie dye colors, 6 pre-measured packets of soda ash dye fixative, plus 100 rubber bands for wrapping your projects to create amazing patterns. Idea guide included. Dye Colors: Fuchsia, Orange, Yellow, Lime, Turquoise, and Violet. Powdered dye = 8 grams per bottle, soda ash = 8 grams per packet. Bottles are 4 fluid oz. Protect skin, clothing, and work surfaces as this concentrate color may stain. Tie dye is such a great craft activity because you can experiment with so many different colors and patterns. There are different methods that you can use to get different techniques, but the most common is using string, rubber bands, and even zip ties. Below we share tips and tecniques for a succesful tie dye project! Download a printable version of this article so you can easily follow the steps and designs. My experience with tie dye is that natural fiber fabric will hold more dye, leading to a brighter, longer lasting result. You can use 100% cotton shirts or even other fun items like scarves, bandanas, and draw string bags. I suggest pre-washing the materials if you can, for sizing and to remove any dirt so that the dye saturates better (do not use fabric softener or dryer sheets, which can leave a residue). Important Tip: If you pre-wash (recommended), there is no need to dry your garment. You want the fabric to be wet (but not dripping) when you tie and dye. Two helpful tips are to wear gloves and to make sure that you secure all folds, regardless of which method you use, with rubber bands or one of the above tools. Also make sure you tie tightly. Material will expand when it is wet, so making sure to tie each fold will secure the dye in place. 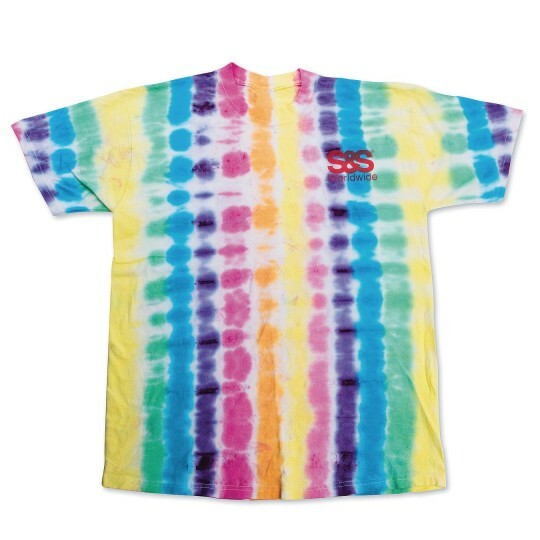 Get it - tie dye! 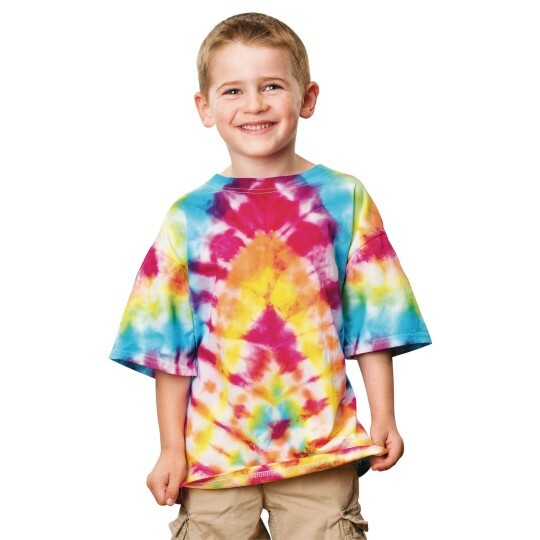 The two most important factors for a successful your tie dye are color choice and color saturation. In order to avoid a large amount of white on your finished product, the trick is to squirt enough dye into the folds. Squeeze the area saturated with dye to insure color penetrates the inside layers of fabric for a bold result. When choosing colors to place adjacent to each other, remember the color wheel. Do not place“opposite” colors next to each other, such as red near green, blue near orange, or yellow near purple: the results would be a brown, muddy mess. If you really like bright colors avoid placing a color with red mixed in it, such as purple, near green. Vertical/Horizontal Stripe: Fold a piece of fabric in vertical pleats, and you’ll end up with horizontal stripes. Horizontal pleats result in vertical stripes. Diagonal pleats are an option for diagonal stripes. Bullseye: For concentric circles, grab the cloth where you want the center to be, and pull, until you’ve more or less made a long tube of garment, then apply rubber bands at intervals along the fabric. Classic Spiral: Lay the garment on a flat surface, smooth out all the wrinkles, then make a small pleat right across where you want the center to be. Grab the very center of that pleat with a clothespin, and begin to twist. As you twist, pleats appear farther away from the center; as these pleats get too large, split the pleats with your hands, keeping each fold the same height above the table, no more than one to two inches in height. Circles: Another technique is to use small rubber bands to pinch and bind fabric in several places all over the garment. This will make circles of color. 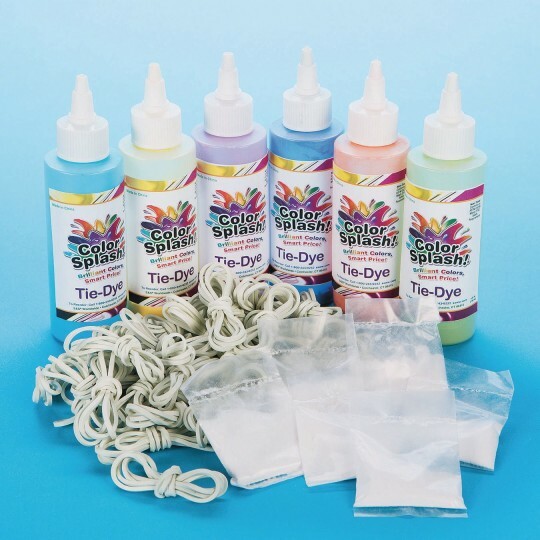 See our Color Splash Easy Tie Dye Kit for even more detailed information on tying tips! Always add powder dye to empty squirt or spray bottles first and then add water. Be careful when you measure out the dye. Leave the jars open as short a time as possible and use a face mask. Don’t breathe in the dye powder! Replace bottle cap and shake until dye is fully dissolved. For best results, apply dye to fabric within 30 minutes of mixing. To help ensure the dye stays on and help preventcolor bleeding, you can pre-soak the fabric for fifteen minutes to one hour in a solution of sodium carbonate (Soda Ash), mixed one cup per 2 gallons of water - unless you are using dyes that have the soda ash pre-mixed in. Before folding and tying your project, rinse or soak in warm water and wring out so the item is not dripping. Damp fabric will absorb the dye much more easily. Once you have your fabric folded/tied, lay the garment on a plastic protected surface. Squeeze the dye directly into the fabric, checking to make sure dye has penetrated into the folds. Squeeze the area you just applied dye to so it gets into the folds. Flip over and repeat on the other side. Seal the dyed fabric in a plastic bag to keep wet. How long should you wait? Make sure that the fabric stays wet for the reaction to take place. It should be kept in the plastic bag for 12-24 hours. Tip: You can drop each fabric item into its own re-sealable plastic bag and label it with person’s name and time to wash out. Carefully cut any rubber bands making sure not to snip your fabric. Rinse by hand in cold water before machine washing. Rinse first in cold water to release excess dye from the fabric, then again in the hottest water available to remove any trace of the un-reacted dye until the water runs clear. Now your garment should be ready for the washing machine. Wash and dry separately for the first few washes. 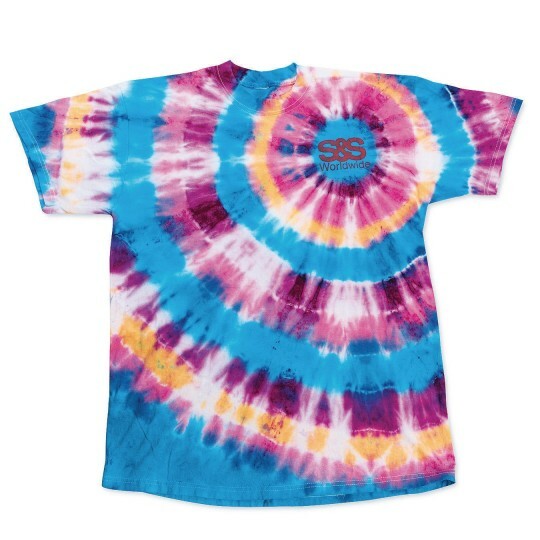 Congrats, you've just created your first tie dye item! Share your photos with us so we can see your creations! 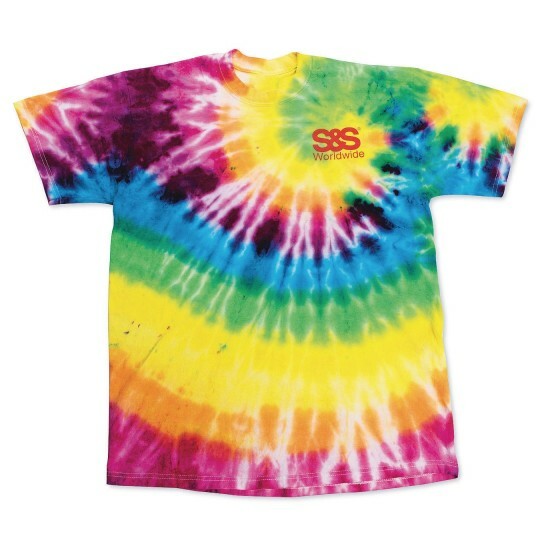 View all of our great tie dye products here!